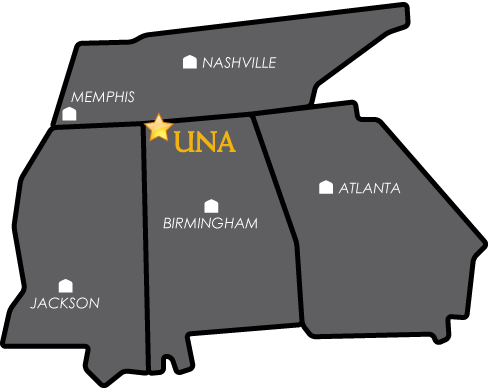 For general questions about graduate admissions in the College of Arts & Sciences, please contact Mr. Christian Walker at coasonline@una.edu. Please also review the College of Arts & Sciences Graduate Student Information Sheet. Criminal Justice - The criminal justice program offers coursework leading to the Masters in Criminal Justice. Upon graduation, students will be prepared for agency employment or continued study in the field of criminal justice/criminology. English - The Master of Arts degree in English at UNA is designed to support students in their intellectual and professional development. The program provides a firm foundation in British and American literature to prepare graduates to teach at the college level or to continue their studies. *Note: If you are wishing to gain a Class A Teaching Certificate, please visit our Education page. Family Studies - The graduate program in Family Studies focuses on understanding the dynamics of families in a changing society, as well as the impact that family interaction has on individual development and success. The core objective of the Family Studies M.S. program is to teach students the essential skills and competencies designed to enhance the quality of life within families. Geographic Information Science - The Geographic Information Science program is an innovative approach to applying spatial knowledge and technology to solve contemporary problems. It focuses on the multidisciplinary application of geography, the spatial paradigm, and methods of geospatial technologies. History - The Master of Arts degree in History at UNA is designed to meet the needs of our students and the modern workforce. Our graduates have a solid foundation in the methodologies of traditional academic history, and are prepared for a variety of opportunities, including professional advancement and teaching. *Note: If you are wishing to gain a Class A Teaching Certificate, please visit our Education page. Interdisciplinary and Professional Studies -The Master of Professional Studies (M.Pr.S) degree program is an applied professional program with workforce development, organizational leadership and personal development at the core of its mission. The M.Pr.S degree offers specializations in Community Development, Security and Safety Leadership, Information Technology and (new to UNA) Higher Education Administration specialization. This graduate degree is designed for career oriented students and offers an accessible, online, and affordable opportunity to achieve educational and professional objectives. Public History - The Master of Arts in Public History at UNA is designed to meet the needs of students interested in pursuing a career in public history. Class projects, fieldwork, and internships prepare students to work in a variety of settings, including archives, museums, cultural resource management firms, state historic preservation offices, and libraries. Writing - Completion of the MA in Writing at UNA will prepare you for advanced careers in technical and professional writing. Some of the many employment opportunities available to our graduates are: technical writing, editing, publishing, social media campaign designers, document design and creative communications management. Graduates will also be prepared to seek a terminal degree in various fields including English, Composition, Rhetoric and a Master in Fine Arts. Mathematics - The University of North Alabama's Online Master of Science in Mathematics degree program is a fully online, innovative approach to graduate level mathematics. All students take a core of five 3-credit courses (including courses in algebra and analysis). In addition, students can choose from concentration/elective courses in pure mathematics, mathematics teaching, or various STEM concentrations. Students seeking readmission to a graduate program in the College of Arts and Sciences must complete this form and submit it to artsandsciences@una.edu. The deadline to apply for readmission is two days before the start of the semester (Fall, Spring, Summer). You will be notified of the readmission decision by the first day of class.